Tom Martin, Friend of The River. 1. We need to make sure these parks stay open beyond these temporary accommodations. 2. We need to take the appropriate legislative actions to ensure this never happens again. NOTE: These openings are TEMPORARY. The leaders mentioned above have stated they acted in response to our messages to them. If this issue matters to you, make sure you let them know. Here is the publicly available document defining the deal between Utah and NPS. Whereas it is a legal document and whereas no one associated with law or politics can be brief, it is.. Well read for yourself. No wonder the government is shut down. 1200 people still in Grand Canyon National Park. And doing just fine. There are currently over 1200 people in the Grand Canyon National Park, rafting the river right now. In the heat of all that is going on with the Federal government shutdown, there is one thing that is happening that just makes no sense. I know there are many people severely impacted by this, but in one case actions are actually being taken that are using more resources than before the shutdown while severely hurting a group of people in a way that is irreversible. I am talking about access to the boat ramp for rafting groups scheduled to raft the Grand Canyon. 50 people a day are arriving at the boat ramp and being denied access. This is not a simple matter of people going on a rafting trip vacation and this does not impact the closure of the park as is proven by the 1200 people that are currently on the river now and doing just fine. 1. People who are being kept from the river that have pre-paid $2000 to the National Park Service for the access permit. This permit covers the costs of staff who meet them at the boat launch. 2. The park does not need to be open to give these groups access to the river. They only need access to the boat ramp many miles upstream of the Canyon. 4. These rafting trips are fully prepared to be completely self-sufficient for the 21 days they are in the canyon. There are currently over 1200 people already in the Grand Canyon, rafting the river. They are out of contact with the rest of the world, they have no way of even knowing what is happening and their presence has NO impact on whether the park is open or closed. 5. Launch dates are given by a lottery 2 years in advance. Some people have been trying to get a permit for over 10 years. For those fortunate enough to win a launch date, they then spend the next 2 years organizing and planning the trip. 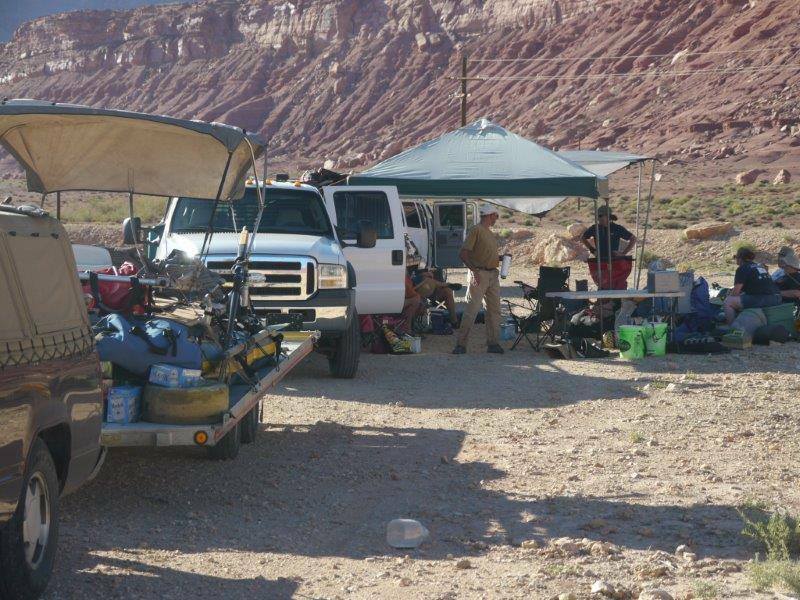 This includes getting a crew of 16 people together; making special arrangements to get 3-4 weeks off from work; planning travel to/from the Canyon from all parts of the country and even the world; spending $18,000 or more on gear rental and food preparation from one of the outfitters. Note that this is also costing the outfitters $20,000 – $100,000 per day that they can’t launch these groups and this money is unrecoverable. Their margins are very low and just a couple weeks of this could drive them out of business. 6. These groups scheduled to launch have no way of knowing if they will get onto the river on their scheduled date or not with the current situation. They have no choice but to make the trip to Arizona where they are finding out as they arrive that they are being denied. 7. If a launch date is missed, there is no way to give that group a new launch date. This is a necessary park service rule. The river corridor can only support a certain number of people at a time. Launch permits are booked solid every single day for the next 2 years. This is limited by the small number of places suitable for camping along the river. Also, the logistics of getting a group together are immense. For most people, they already have a very tight schedule. Airline tickets are non-refundable, arrangements for time away from work, etc. And the outfitters are booked to capacity many months in advance. It is very unlikely they could reschedule their trips even if that were an option. Due to the great hurdles and logistics involved in rafting the Grand Canyon, this is truly a one-chance-in-a-lifetime experience for most people. Every day the park service blocks ligitimate access to the river, they are causing huge financial and emotional impacts unnecessarily on more than 50 people. Some of the people who have been turned away have been waiting for a permit since 1995. Listen to this brief interview by NPR of a permit holder at the blockade. Listen to this NPR interview with National Park Service Director Jon Jarvis. Short Youtube video showing the scene at the roadblock by one of the rafters. 1. End this government shutdown immediately. Best solution, but also highly unlikely. 2. 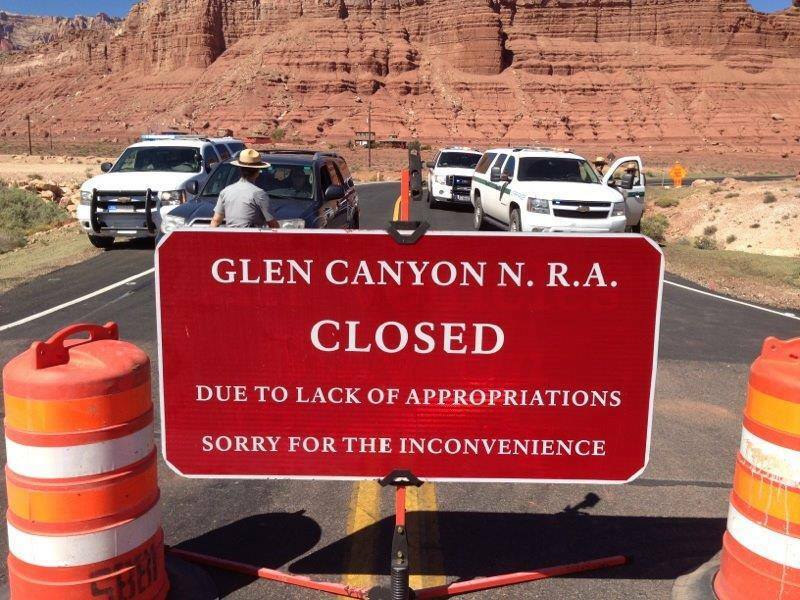 Get special funding to pay to keep the park open. Governor Brewer of Arizona has been asked to have their state do this. Considering the revenue generated by the 3 million annual visitors to the park, this would seem like an easy decision, but she doesn’t appear close to doing this. 3. Allow the rafting trips access to Lees Ferry boat ramp as usual. Reduce the manpower needed at the boat ramp and allow these groups to proceed without adding any burden to the park. Now some people may say that getting turned away from a vacation doesn’t compare to the other problems being caused by this shutdown, like Meals on Wheels or domestic violence centers. Everyone would agree there are more life-threatening issues at stake. But there is nothing preventing us from working on finding solutions to as many possible issues as we can at the same time. And this one is such an incredibly easy fix that actually saves money and resources, it doesn’t make sense not to do it. 1. Please contact National Park Service Director Jon Jarvis and present this idea to him. 2. Please contact Grand Canyon National Park Superintendent Dave Uberuaga and urge him to do the same. 3. Please contact Arizona Governor Jan Brewer and encourage her to help at least fund the boat ramp operation if not the park. 4. Please work to get this leadership gridlock resolved. Wondering what these people are missing? Check out the journal of my trip.